Gunda Gottschalk is a violinist and Ute Völker is an accordionist, both of whom are based in Wuppertal, Germany. A few years ago they were invited to play at the Roaring Hooves Festival in Mongolia, where they struck up a friendship with that event's organizer, Badamkhorol Sanandamba (a famous singer herself). 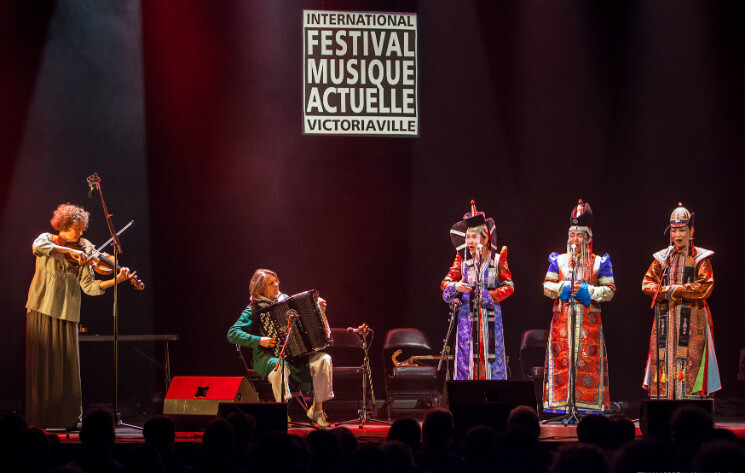 They eventually started to work together, along with Badamkhorol's two sisters, and created this project, which combines European free music with traditional Mongolian vocal stylings. For the show, the five performers took a "Company Week" approach. From solos to full quintets, I'm pretty sure every possible configuration was explored. Gottschalk and Völker's playing keyed into all possible attack-variations inherent to their instruments — from long notes to scattered plonks — and the sisters (resplendent in ceremonial costuming) alternated between singing and telling stories in a somewhat theatrical mode. The most fascinating parts were the ones where they all played together, while hewing to their own artistic strengths. There were a couple of pieces built around the differences between their two wildly different performance aesthetics, which emphasized both the distance between them and the closeness binding them. In all, it was a very interesting experiment in culture grafting. It looked like they were having a great time as well, which is always a plus.